In our April edition of our Preemie Family newsletter we learned about 31-week preemies Matthew Cross and Callia Faith Castleberry. Matthew was born at 5 lbs 2 oz. and spent 143 days in the NICU before being discharged to home. 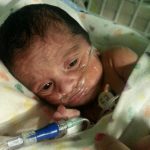 Callia was 3 lbs 3 oz. and spent 56 days in the NICU before being discharged to home. Read more in an update by their mother, Angelina, below. Life with twins has never gone as planned. Even with our pregnancy, everything has always been a shock and a challenge of some sort. When we first confirmed our pregnancy at 8 weeks via ultrasound, there was only one baby and one heartbeat. When we went back for a monthly check up at 14 weeks, we found two babies!! It was a surreal moment. We also found out we were having a boy and a girl (We already had 4 girls before the twins came along, twin boy Matthew was our first and only boy). Our entire pregnancy, once finding out about Matthew’s prenatal diagnosis with a Lower Urinary Tract Obstruction, was an even bigger challenge with trying to find a way to intervene and save his life. Fetal surgeries are becoming more common now, but the type that Matthew and his twin sister Callia endured was everything but common. The twins had two fetal surgeries before being born at 31 weeks by emergency c-section due to Matthew’s placental abruption. Those first few days for Matthew were devastating, to say the least. Not only were we always warned that he may not survive our pregnancy because of having no amniotic fluid by 22 weeks, but with the many complications he had at birth, we needed to be prepared for the worst. Callia needed help with breathing for a couple weeks after she was born. She was so tiny, weighing a little over 3lbs. I remember she was always so quiet and calm in the NICU. She rarely cried or moved around. It seemed that all she ever wanted to do was sleep. I was reassured that preemie baby’s need more sleep than term babies because they still need to grow. Little did we know she would turn into the little ball of energy that she is now. Callia spent 7 weeks in the NICU initially, but days after being home she was having problems breathing. 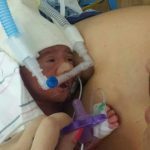 She began to have Apnea spells and she was admitted back into the NICU, but this time in our local NICU, not the same one that her brother was in over an hour away. 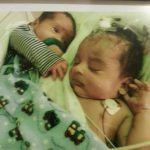 For an extra week, we had two babies in two separate NICUs. first surgery when he was two weeks old to place a g-tube and a dialysis catheter. He began dialysis a couple of days later. Matthew spent a total of 143 days in the NICU. Not one day was an “easy” day. Each day was a challenge, each day we were faced with many obstacles and each day was considered a true miracle. Altogether Matthew underwent 9 surgeries while he was in the NICU, not one of them was considered routine. I try not to use this term, but the NICU was a horrible “roller coaster.” One morning he is stable, afternoon he is being intubated, the next day he is bright eyed and bushy tailed without a care in the world. Good days were good days and bad days were really bad. There was never an in-between. Callia & Matthew, before Callia’s discharge at 8 weeks old. Trying to juggle NICU life with home life was the hardest thing for us. But I was given some amazing advice to learn how to live in both worlds… BE THERE… wherever you are at- home or NICU- BE THERE. My girls at home needed me to be there completely. And my son needed me to be with him to be his advocate. I couldn’t afford the “distraction” of worrying about either child in either place. They each needed my full love and attention, and I did my best at giving them that. 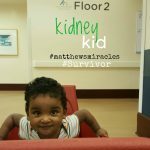 Since being out of the NICU, Matthew has had two additional surgeries, both due to his kidney disease with which he was born. He has also had more hospital stays than I can count (RSV, heart problems and the many complications that kidney disease causes in babies). 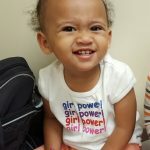 Now, at 20 months, Callia is running around and rambunctious and curious as any other toddler would be, learning and loving life. She does have some neurological issues that she is under observation for and we are dealing with that as each appointment comes. She will be beginning speech therapy with her twin brother soon as well. Matthew is the greatest fighter I have ever known. He has come a long way and has endured far too much in his short life. Much more than most adults do in one lifetime. But this little boy is so full of life, just like his twin sister. Physically, he is delayed and is just now starting to gain strength in his legs to stand. He has therapy sessions every week and is coming along great! Matthew is on dialysis right now and comes to the Children’s Hospital 4 days a week. Since before Matthew was born, we have practically lived at this hospital. It really is our second home. One thing that Matthew and Callia have taught us about life is that we must love the life that we are blessed with. Trusting in God’s plan for our family has always been key. Matthew still has a long road ahead for recovery, but he is a true warrior. Our family is complete and we are living and loving our blessed life. Editor’s Note: Check out Made for a Miracle !